10 - Melodyland School of Theology with (left to right) Lou Sheldon, Professor and Assistant Administrator, J. Rodman Williams, Professor and President, Dennis Bennett, Episcopal priest and Board of Trustees member. Williams was very impressed by the "Jesus movement" occurring in southern California, spread mainly by two churches: Calvary Chapel led by Chuck Smith and Melodyland Christian Center (a four thousand seat amphitheater once owned by Disneyland) led by Ralph Wilkerson. 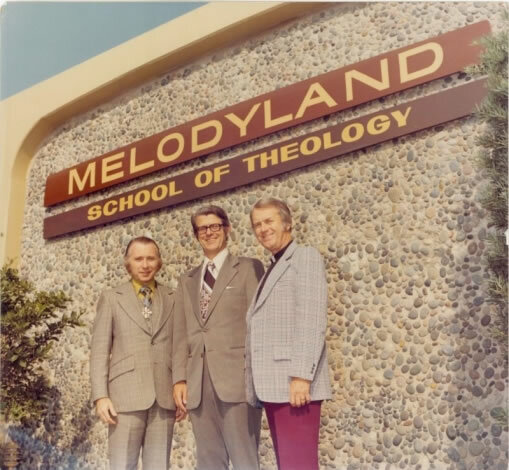 When Wilkerson asked Williams to come to Melodyland and start a school to train leaders, Williams accepted, resigned from Austin Seminary, and moved to California to form MST, Melodyland School of Theology, adjacent to the Center. Within a few years the school had graduated several hundred students with over 700 students usually enrolled. Williams stayed at MST for ten years (fall of 1972 to the fall of 1982).